Fourteen percent of the European Union's gross domestic product is accounted for by government or public utility works, supply, and service contracts. Yet in spite of its major importance for the European economy, public procurement remained for a long time one of the areas which benefited least from the creation of the internal market. Awarding contracts across borders was fraught with complicated provisions and rigid, protracted, bureaucratic procedures. Furthermore, the possibility of mainstreaming social and environmental interests in procurement practice seemed remote. In 1996, the Commission proposed amendments to the existing legal framework, prompted by the emergence of the information society, the gradual withdrawal of the State from certain economic activities, and increased budgetary austerity. The ultimate result, after many years of gestation, was Directive 2004/18 of the European Parliament and the Council on the Coordination of Procedures for the Award of Public Works Contracts, Public Supply Contracts and Public Service Contracts. the development of the "negotiated procedure" and the "framework agreement"
combating corruption and organised crime. The book first presents documents that outline the reasons that led to the intention to integrate public works (93/37/EEC), supply contracts (93/36/EEC), and service contracts (92/50/EEC) into one new directive. Then follow documents that detail the drafting of the recitals in the Preamble, the articles and the annexes. Finally, a list of legislative documents offers as complete an overview as possible of every item that played a role in the creation of Directive 2004/18/EC, including several amendments that have been made to the directive since it came into effect. 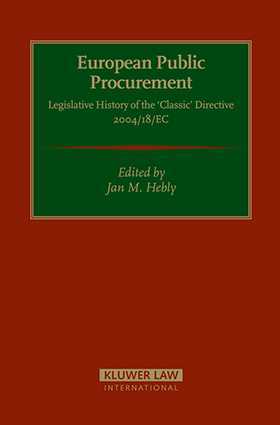 This unique publication will be a powerful resource for lawyers and policymakers engaged in the development of European procurement law. It will also provide both practitioners and researchers working in the area of European procurement law with an incomparable desktop reference on Directive 2004/18/EC.